FEBRUARY 2012 - Susan Brubaker Knapp in addition to being a busy wife and mom is an award winning fiber artist, author and teacher who has really made her mark in the quilting world. Susan’s unique quilt designs are often inspired by the images of nature her camera captures. She tells me the feature she loves the “micro” button on her three cameras which allows her to shoot very close and yet maintain focus. “I always carry a very small camera in my purse just in case something presents itself. The cost of the camera is not what’s important”. Susan’s latest book entitled Point, Click, Quilt, teaches mastery of the techniques of fusible appliqué and thread sketching based on photographs. She doesn’t have an art background but an English major going who went on to earn a master’s degree in journalism. After college Susan worked as a graphic designer on a newspaper and holds the firm belief everyone can learn to be creative and artistic. “Most people just don’t take the time!”, she exclaims. A highlight in 2011 was having her “Hope is the Thing” quilt being selected as part of the International Quilt Festival in Long Beach and Houston. It now has been purchased and is part of the International Quilt Festival Collection. 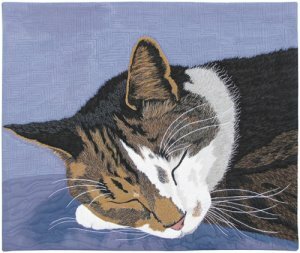 Susan’s “Maximum Cat Nap” also was a prize winner at 2011 Quilt Festival. 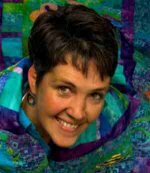 This spring she’ll be teaching in the Netherlands for eight days and then go on to Johannesburg, South Africa for the first International Quilt Convention-Africa. All of this added to her already full teaching schedule and Susan will be bringing the creative possibilities to us through new books, patterns, DVD’s and TV segments. The Latest from Eazy Peazy! 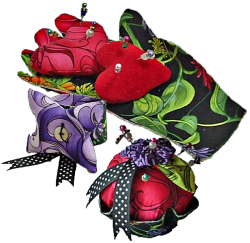 The Peazy Pincushions—a trio of different and unique pincushions in the distinctive Eazy Peazy style. Each makes use of one of the hottest new products inn-spire™ plus (moldable stabilizer) and all require minimal sewing making them ideal for projects, gifts and beginners. “The Pozie Wrislet” not only is fun to make and practical but is a great party favor. “Hearts in Hand” is totally unique. The pattern is a hand—yours or a loved one’s. “The Cutest Cupcake” is both whimsical and the perfect size to fit next to your machine. Add on sales opportunities have been are created by use of the inn-spire™ plus and the Cutest Cupcake makes use of the Clover Yo-Yo Flower Maker and the Kanzashi Flower Maker.